A nice, funny, and charming movie about the relationship between an older man and the boy he helps take care of. St. Vincent is an enjoyable film simply because of Bill Murray. Here’s a guy who really can do just about anything. This film doesn’t have an especially original plot or structure, but the character that Murray plays (the grouch who has to take care of a kid,) is so interesting, that we can’t turn away. Especially in the later portions of the film where the real Vincent starts to come out. This is a guy who likes the way he lives, including the alcohol and gambling, and wouldn’t do it any differently if he had all the money in the world. He starts spedning time time with a boy who lives next door and needs someone to babysit him after school. The two of them get into some fun scenes together, and it ends up being a pretty entertaining film. Predictable, sure, but still enjoyable and fun. 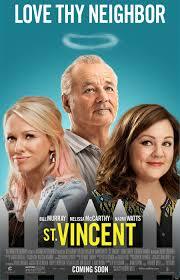 St. Vincent is the movie about Bill Murray (Vincent) as a grumpy old neighbor who is forced to take care of a boy. It’s the kind of story we’ve seen a bunch of times before, where the adult is reluctant to have any part of this situation which will take him away from his comfortable life. Usually it’s something like a dad who never knew he had a kid and now something happens to the mom and the kid has to live with the dad. Of course it’s always the dad character in those movies who is learning and growing and changing along the way, starting to embrace the kid and allowing the kid to help him come out of his shell. In St. Vincent, it’s not a dead-beat dad, it’s a neighbor. And it’s not just any old actor, it’s Bill Murray. For comedic ability you can’t do much better than Murray, but if you absolute needed to, on the female side, you would probably look to Kristin Wiig or Melissa McCarthy. This movie has got McCarthy as well. She plays the mother of the boy in question, and when she and her son move in next to Vincent, the fun begins. Before these guys come to live next door to him, we meet Vincent and learn that he is a drunk and a gambler. He goes to the race track on a regular basis, takes money from people he can’t pay back, and then has to deal with the consequences. He also spends his time at a bar, drinking away each night, until the bartender cuts him off. And Vincent doesn’t exactly have money to pay for these drinks. When he goes to a bank to try and close his account he learns that he actually owes them money and can’t close the account until he pays it back. That’s about the point where Oliver comes in with his mom, Maggie. It’s right after a night of Vincent drinking himself into a black out on the kitchen floor, but not until after he bangs his head against a cupboard, slips on ice on the floor, and has blood all over his head. The next morning, he wakes up on that kitchen floor to the sounds of the moving truck and the moving men yelling at each other. Their truck hits a tree and knocks down one of the branches. The branch falls down and lands on Vincent’s car. And this is how our main characters all meet. Vincent isn’t exactly nice to Maggie at this point, blaming her for the incident that has damaged his car and insulting her about how much money she must make. They definitely get off on the wrong foot with Vincent telling her he’s going to sue the moving company, but she can pay for the fence and the tree. I like how she asks him about the tree, wondering how she’s supposed to handle that. From this point on we now start following Oliver and Vincent, often in two separate plots. With Oliver, it’s about the things that are happening at school. He is the new kid and a bunch of other kids gang up to bully him. They takes his things out of his locker and steal them. They jump him outside. And they bully him for telling on them. Oliver’s mom isn’t there to let him in the day those kids steal his keys, and so Oliver can’t get into his house. That’s when he goes to stay with Vincent. When Maggie gets home, she sees that Vincent can maybe be an after school baby-sitter for Oliver. And so the friendship starts. With Oliver, we continue to follow him with the bullies, only this time Vincent teaches him how to stand up for himself. He teaches the boy how to fight. Then one day in gym class, when the boys peg Oliver in the face during a dodgeball game, so hard that it makes him bleed, he decides it’s time to take action. He uses what Vincent has taught him and runs at the boy who threw the ball. Then Oliver does the exact move Vincent showed him and breaks the kids nose. The boys end up getting detention together because of all this and then becoming friends. With Vincent, we meet a whole bunch of other characters as well. There’s the Russian prosttute, Daka (played by Naomi Watts) who is Vincent’s best friend and keeps him company on a pretty regular basis. Then there’s the bookie who he owes money to, played by Terrence Howard. And finally, there’s the woman who Vincent keeps going to see in a hospital, and pretending that he’s a doctor. He clearly knows her from another life, but cannot let on who he really is. All of this comes together more as the movie goes on. The first half of this movie is good, but it’s also somewhat routine. It’s the second half that really comes to life. That’s where something very unexpected happens to Vincent which causes him to be a different character for most of the remainder of the film. It’s also where we get some closure about him and the woman in the hospital, and where things really start to make sense. The movie is not incredibly original or anything, and it even follows a sort of romantic comedy formula of having a fight towards the end, only to come back together again. St. Vincents works overall because it is heartfelt, and because Murray is such a natural talent. He’s very funny here, playing the black comedy angle that he has done so well over the past decade and a half in the films of Wes Anderson. McCarthy is good too, only she’s not used for any comedy here. As an actor playing it straight, she does a nice job. The movie is definitely enjoyable, but it also doesn’t feel like anything that creative which we haven’t seen before. What happens to Murray is unexpected, but otherwise this movie turns out to be pretty routine. It’s fun, without being anything great that you need to see more than once.